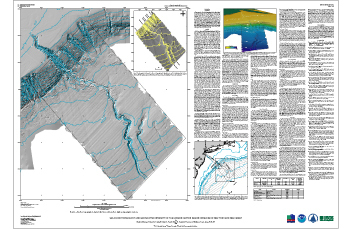 This report presents maps of the sea floor topography and backscatter intensity of the Hudson Canyon region on the continental slope and rise offshore of New Jersey and New York at a scale of 1:300,000. Sheet 1 shows sea floor topography as shaded relief. Sheet 2 shows sea floor topography as shaded relief with backscatter intensity superimposed in color. Sheet 1 also contains interpretive text, and both sheets contain figures and tables that further present and describe the data. The maps are based on multibeam echo-sounder data collected on an 18-day cruise carried out aboard the National Oceanic and Atmospheric Administration (NOAA) Ship Ronald H. Brown during August and September 2002. The interpretive text, with links to figures, can also be viewed in html using the links on the navigation bar on the left side of this page. The List of Figures page includes thumbnails and links to all the figures on the map sheets. Citation: Butman, Bradford, Twichell, D.C., Rona, P.A., Tucholke, B.E., Middleton, T.J., and Robb, J.M., 2006, Sea Floor Topography and Backscatter Intensity of the Hudson Canyon Region Offshore of New York and New Jersey: U.S. Geological Survey Open-File Report 2004-1441, CD-ROM. 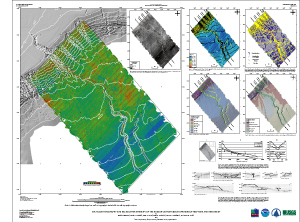 Also available online at http://pubs.usgs.gov/of/2004/1441/. Version 2.0. This version was posted September 6, 2006. It corrects a subtle shading error on Map Sheet 1. PDF file sizes have been reduced.